The fun part of the home buying experience is going out on showings. You’ll go on dozens of showings during your home search, so this section sets out everything you need to know about the showing process. The foundation of the home search process is the property “showing,” which is an appointment set by your agent to go visit a property or a series of properties. Even though it can be a lot of work, most of our clients actually enjoy this part of the process. There’s something exciting about every showing: the anticipation of seeing the home live that you’ve only before seen in pictures, the suspense of wondering whether this will be “the one,” the fun in imagining what it would be like to live in each home. Even more importantly, every showing you do is part of your educational process in refining your understanding about your own preferences, helping you and your agent learn about what you like and don’t like. •Scheduling. The process of setting up a showing is very simple. You identify a series of properties that you’d like to visit, find a window of time when both you and your agent are available, and then your agent will contact all the sellers or listing agents to make an appointment to see the home. It’s your agent’s job to set the appoin tments, not yours – that’s one of the reasons you hired your own agent. •Notice. Generally, you don’t need to give more than 24 hours notice before setting up a showing. 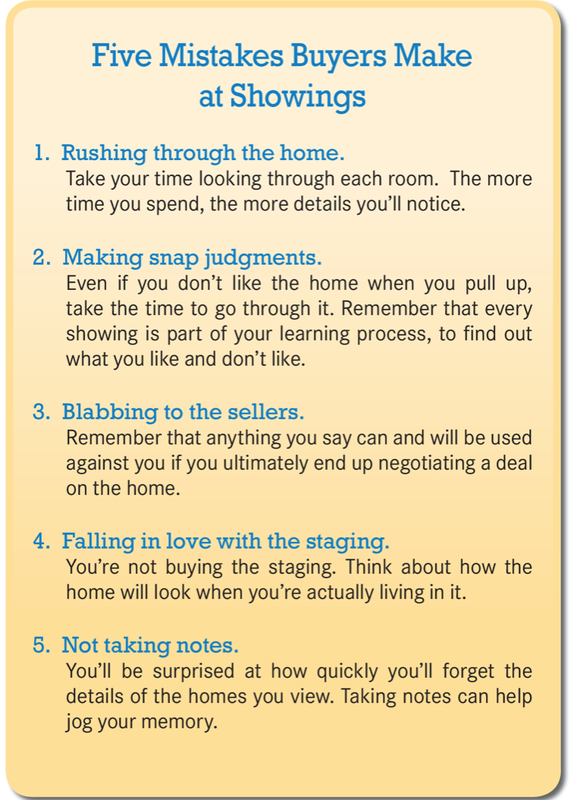 Most sellers are eager to have agents show their homes, and will agree to showings on very little notice. Some sellers do require more extensive notice, though, something your agent will be able to determine from the property information accessible to brokers in the MLS. •Time Commitment. You’ll usually spend about 15-30 minutes in the actual showing of the home, depending on your level of interest, but remember that you also have to factor in travel time. If you’re seeing a lot of homes in a very small geographic area, you might be able to see three or four homes in an hour. But if you have to drive a long ways between homes, then you might only get to one or maybe two in an hour. Your agent will have a good sense of the schedule. •Traveling to Showings. Whether you travel together or separately is up to you and your agent. Having the agent with you can be helpful for facilitating conversation and feedback between showings (and is environmentally preferable! ), but sometimes you all can’t fit in one car. •What You’ll Get. When you meet with your agent to start the series of showings, you’ll probably get paperwork on all the listings you’re going to see. It’s a good idea to get a folder to keep all those “showing sheets,” because you’ll eventually see so many homes that it’ll be tough to keep them organized in your head. Keeping the show sheets, and taking notes on those sheets, is a good way to keep track of the properties you’ve seen and what you thought about them. •Feedback. After showings, or during showings if you are alone, you should give feedback to the agent about what you liked and didn’t like, so long as the seller or listing agent aren’t present. You should be as honest as possible in communicating your interest to your agent, who needs that kind of information to learn about you and your preferences. Your agent might also ask you to give formal feedback that can be communicated back to the seller, particularly for properties that you’re not really interested in. 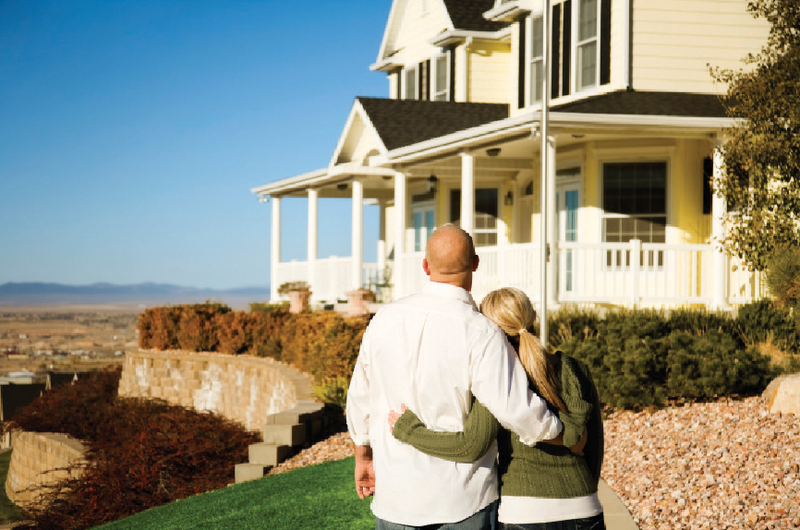 Sellers appreciate that, because it sometimes helps them adjust their price or presentation of the home. You’re not under any obligation to do so, but it’s considered polite to provide feedback if asked. •Canceling Appointments. If you have to cancel a showing after setting an appointment, just try to give as much notice as possible to your agent, who will then cancel the appointments with the seller or listing agent. It’s no big deal to cancel an appointment, although it’s very discourteous to simply not show up when you were expected. •Keep an open mind. Sometimes, you’ll pull up to the front of the property, and you’ll immediately make a snap decision that this is not the home for you. That’s fine. Tell your agent why. But you should still go into the house to look around. Why? Because we have many buyers who ended up buying a home that they absolutely hated on the first impression they got on the curbside. But even more importantly, you’ve already taken the time to drive over, you might as well go inside. Even if you don’t like the home, you might find something about it that you do in fact like, and your agent can learn from that. Every showing is part of the educational process of learning what you like and don’t like, so always keep an open mind regardless of your initial impressions of a home you’re seeing. •Try to visualize yourself living there. A great way to develop a good feel for whether this is the right home for you is to just imagine yourself living there. Think about what it would be like to wake up every morning in the master bedroom, to make breakfast in the kitchen, to have meals in the dining room, to sit back and watch television. Visualize where your furniture would go, and how it would look in the home. Essentially, try to imagine what it’s like to live there. If you like that image, then this might be a home you want to consider buying. Most of the time, you’ll be able to see properties with just your agent, particularly if your visit is during the workday. Sometimes, though, the sellers might happen to be home when you’re looking at the property. That can always be a little awkwa rd, particularly if the sellers hover over you or want to do the agent’s job for her by showing you the house themselves. Other times, the listing agent might be present, particularly in the rare cases where the seller demands that the listing agent attend all showings. In those cases, it’s always a good idea to be as friendly and likeable as possible with sellers. You might end up doing a deal with them, and you’d be surprised how much basic courtesy and friendliness can facilitate a good negotiating relationship. And if you end up in any kind of bidding war for the property, you’ll find that just being a friendly person can sometimes give you a leg up in getting your bid approved. So just be nice to them. And, of course, never say anything critical or derogatory about the property (the decor, the cleanliness) in front of the seller or listing agent, because insulting the homeowner is a bad way to start a negotiation. On the other hand, you want to be careful about what you say about your personal situation. You don’t want to give away anything that might undermine your negotiating position if you ultimately decide to make an offer, such as your level of interest in the property, how it compares to other homes, your personal finances, your urgency to move, or your price range. For example, you might think it’s harmless to answer a seller’s question about whether you’re currently renting or owning, but answering it might inadvertently reveal your urgency for moving. Similarly, remember that listing agents have a fiduciary duty to their sellers, so telling that nice agent something like “this is the best layout we’ve seen” could end up undermining your negotiating posture later. Just like in cop shows, anything you say can and will be used against you. So when you’re talking to listing agents or sellers, just keep it on a very superficial level. Make polite compliments about the home, compliment the furnishings, ask them questions to get them talking (and maybe revealing something! ), and most of all let your agent do the talking. If they ask you direct questions that you don’t want to answer, just be vague in what you say. You don’t want to be rude by ignoring the question, nor do you want to raise hackles by “lawyering up” – saying something like “my agent told me not to talk about that.” Just say things like “we’re not sure yet, we’re very flexible” or “we’re discussing that very issue with our agent.” And then just ask them a question yourself to change the subject. Generally, you’re not going to get the third degree when you see a home, so don’t worry too much about it. 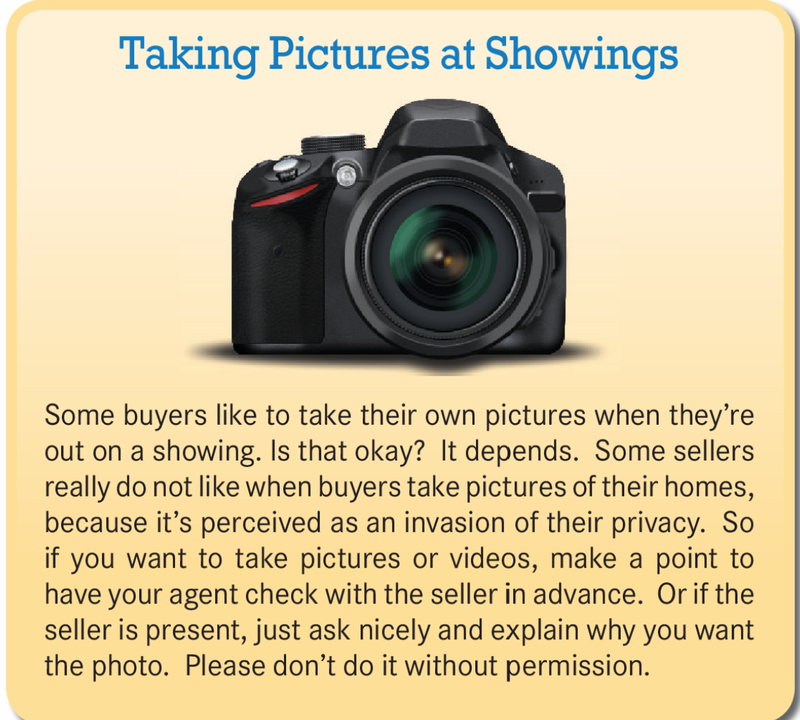 Sellers generally don’t ask buyers a lot of questions, and listing agents know that they’re not supposed to ask a represented buyer anything personal. Because you’ll be spending a lot of time with your agent, you should try to maintain an open line of communication in order to forge a strong working relationship. Here are some tips on how to work best with your agent. During the course of your home search, your buyer agent is your best asset for helping you navigate through the inventory of properties that you might be seeing. After all, you might not have done much home-shopping, but your agent looks at houses almost every day, and can often pick out positives and negatives that you might not have noticed. it out with your agent. It’s her job to serve your needs the way you want to be served, so be clear about what you want from her. Most importantly, though, find some way to stay in regular contact with your agent through the home buying process, even if it’s just a text message once in a while to update her (or her updating you) on the status of your home search. •Second, be honest about what you like and don’t like. As your agent works with you, she will get to know your preferences, even things that you don’t yourself identify as being important to you. Maybe she’ll notice that you seem to like homes with an open floorplan, even though you originally said that you instead like traditional room layouts with more privacy. Every time you see a house with your agent, she learns something about you. So you need to be honest. If you don’t like the house, tell your agent why. Don’t feel you need to spare his or her feelings by holding back – if the agent missed the mark in selecting properties to show you, be honest about it. She’s not going to take it personally. After all – that’s her job. •Third, don’t be reluctant to ask your agent for help. 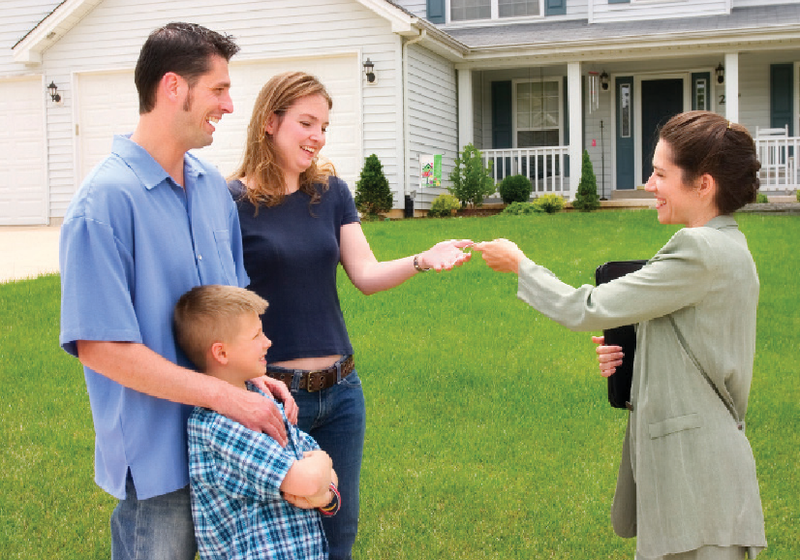 Remember that your agent makes his or her living by helping you buy a home. Sometimes, buyers feel reluctant to call their agent to take them out, because they’re early in the buying process and they don’t want to “waste” their agent’s time. But it’s your agent’s job to help you in the home-buying process, and agents will often work with buyers for months and months before the buyer finds the right home. If you’re really just “sight­ seeing,” or in such an early stage of your process that you don’t feel comfortable going out with your agent, then work on your own and just use your agent as a resource for information. For example, she could set you up with automatic alerts for new properties coming on the market, or let you know about open houses that you might want to visit on your own. But once you’re serious about your home search, don’t feel inhibited about calling your agent. You’re not being an imposition if you need your agent to spend a day showing you homes. That’s your agent’s job. •Fourth, keep your agent in touch with anything you do on your own. Over the course of your home search, you might find yourself doing some work on your own in addition to all the appointment showings with your agent. You’ll probably be saving properties online on RandRealty.com, which is how most of our clients get their first look at the home they ultimately buy. Buyers also sometimes do drive-bys of properties that they see listed online, just to get a look at the property and maybe check out the neighborhood. And many of our clients also go to open houses, when sellers open the property to the public, usually on Sunday afternoons. These three other types of “showings” are all good ways for you to get engaged in your home buying process, particularly at the beginning when you might be reluctant to go out with an agent. But just remember that looking on your own is really only a supplement for the work that you’ll do with your agent. Looking at the property online or doing a drive-by is no substitute for actually visiting the home in person accompanied by an agent who will be able to provide a professional perspective when making your evaluation. And while open houses also involve personal visits, you’ll find it’s much more efficient and effective to set your own appointments rather than being limited to Sunday afternoon visits of whatever properties happen to be open that weekend.